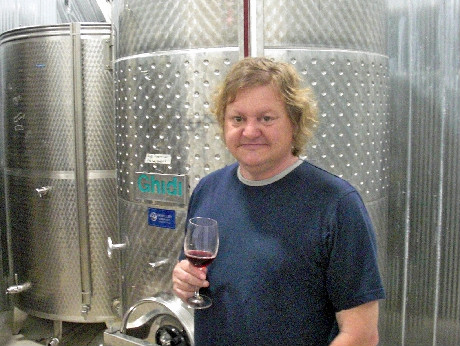 Dan Sullivan: founder, viticulturalist and winemaker at Rosehall Vineyards. Photo by Rick VanSickle of Wines in Niagara. 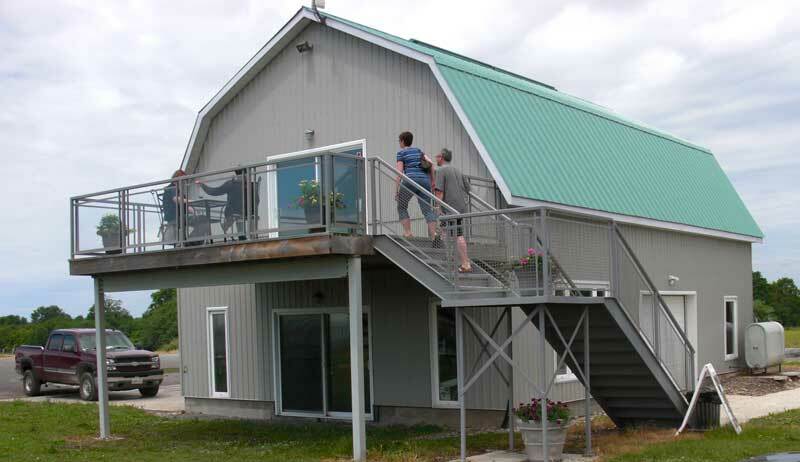 In 2000, Dan Sullivan, his partner, Lynn Sullivan, and their brother-in-law Cam Reston, purchased a 150-acre farm in Hillier, Ontario, in the heart of what was then just the beginning of the Prince Edward County wine region. The vineyard was planted in 2001, first harvest followed three years later, and in 2006, Rosehall Run Vineyards, named for the nearby hamlet of Rosehall, opened to the public with its first offerings. Since then, accolades and awards have followed, and Rosehall Run has become widely known—as much for its fine artisan wines as for the efforts of the Sullivans to raise the profile of the wine and local food communities. Dan Sullivan is the vineyard manager, viticulturalist and winemaker, overseeing every facet of Rosehall Run’s operations. Prior to founding Rosehall Run, Dan spent 15 years honing his craft as a home winemaker, being named Grand Master Winemaker by the provincial association. Since that time he has certainly upped his game, now producing 6,000 cases a year, yet he still maintains a hands-on approach to managing the vineyard. He monitors the weather and its effects and uses gentle, environmentally-sound grape farming techniques to extract optimum results from the unique Prince Edward County terroir, which is clay soil on a limestone base. Planting of the vineyard began in 2001, with Pinot Noir and Chardonnay occupying the majority of the 23 acres now in production. In addition to using their estate grapes, fruit is also sourced from other Prince Edward County and Niagara region vineyards. Great view of the vineyards from the tasting deck at Rosehall Run in Hillier. Photo by Rick VanSickle of Wines in Niagara. Rosehall Run’s wine is produced on-site in stainless steel tanks and aged in French, Hungarian and some Canadian oak. With a range of award-winning wines to sample, complimentary tours and a new tasting room in the works, Rosehall Run is definitely worth a visit on any County wine tour. Here are tasting notes on three of the most popular vintages. 2008 Sullyzwicker White: With a bright straw colour, the Sullyzwicker White is a satisfying blend of Riesling, Chardonnay, Musqué, Ehrenfelser, Pinto Gris and Muscat Ottonel. It is a light-bodied, summery blend with floral notes and a mineral finish. 2007 Cold Creek Cabernet Franc: Aged in French oak, this wine has an abundant bouquet, and tantalizes the palate with rich tones of smoky blackberry and a long, dry finish. 2008 Chardonnay Rosehall Vineyard: Creamy and sweet, this Chardonnay is produced exclusively from estate grapes. It has a rich nose and pleasing aspects of vanilla and ripe peach. 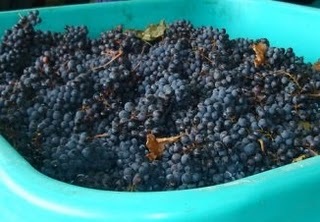 Pinot Noir grapes fresh from harvesting at Rosehall Run. Photo by Toronto Tasting Notes. Rosehall Run wines can be purchased at their retail store and through their website. Also available at some LCBO, LCBO Vintages, WineryToHome and select Ontario restaurants. Rosehall Run Vineyards will be a Featured Winery at The Great Canadian Cheese Festival taking place June 4-5 at Crystal Palace in Picton, in the heart of Prince Edward County, Ontario’s newest wine region and fastest-growing culinary destination. Rosehall Run wines will be available for tasting at Cooks & Curds Cheese Gala on Saturday and during Cheese & Artisan Food Fair on Sunday.